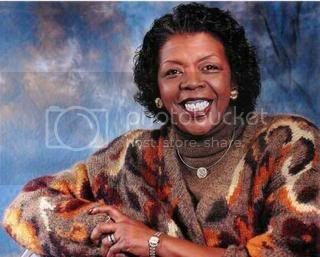 I just read at Feministing that Stephanie Tubbs Jones, "the first black woman to represent Ohio, and one of only 23 women of color in Congress" has died. Jones attended law school at Case Western University and served as a judge and a prosecutor before being elected to Congress in 1998. When the Democrats took control of the House in 2007, Speaker Nancy Pelosi named Tubbs Jones as the chairwoman of the Ethics Committee. A strong supporter of Hillary Rodham Clinton, Tubbs Jones endorsed Barack Obama in June and was scheduled to attend next week’s Democratic National Convention in Denver. She was only 58 years old. This is a huge loss to the people of Cleveland and the whole country. My thougths are with her family and loved ones. Melissa and Pam have more. Thanks for posting on this. I'm originally from the Cleveland area (just left Ohio 3 monts ago), and I've always had an interest in her career. I'm sad for both her family and for my hometown. She did so much for Cleveland, for Ohio, and for this country. I don't know when Ohio will find someone to replace her in terms of energy, confidence, and passion. This hit me hard as an Ohioan as well, even though I'm not from Cleveland. It's just really sad.